Another techy feature is the "virtual butler" that can figure out who's driving based on their smartphone and set up the seating, climate control, navigation options and music to suit. 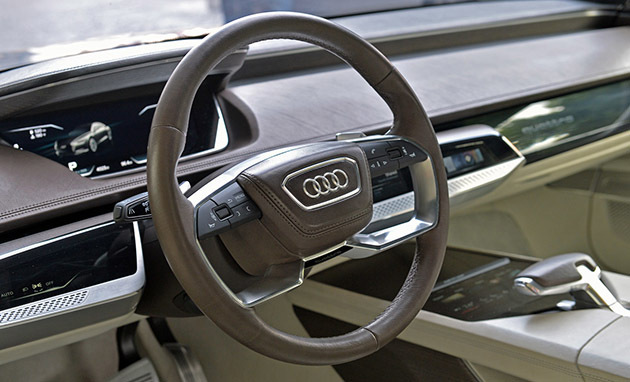 We imagine that placing calls, listening to music on your device and other connected-car options are a formality as well. Otherwise, the Prologue is just your run-of-the-mill, 605HP one-off concept vehicle worth millions of dollars, that the lucky folks at Autoblog had a chance to tool around in. They found its sharp, understated styling "incredible to behold," especially with touches like 3D molded rear taillights and exhaust ports. As for how soon any of this finds its way into a retail model, who knows? Even if it did, this writer would need to discover a long-lost rich uncle to have any chance of affording it. For more, check Autoblog's report and the video below.